Jamieson Brothers are proud to announce the arrival of a new specialized blight tester kit that is of proffesional quality that we will use ourselves in the coming season. This kit is state of the art and now you can buy it online from us. Based on the technology of the home pregnancy test, Pocket Check brings healthcare to your potato and tomato plants. Using Pocket Check, in just 3 - 5 minutes you can identify the cause of disease symptoms and start putting control measures in place. Jamieson Brothers are pleased to be the first to bring you this product online and at a great price. No more is it blight or isn't it? this kit will answer the question in 3-5 minutes. Each kit is enough for taking 2 samples. 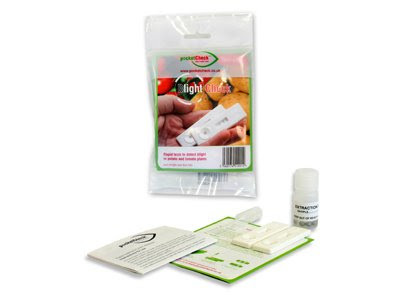 Blight Check will allow you to test for one of the most common and damaging fungal diseases affecting tomatoes and potatoes, Tomato blight and Late blight of potato (Phytophthora infestans). The kit contains the following:2 x Phytophthora test, 2 x sample extraction bottle (containing extraction buffer and ball bearings), 2 x pipette, instructions and disease information card. The simple extraction system makes using the Blight Check easy. A test takes less than 10 minutes to complete. A small sample from a plant with suspect symptoms is added to the extraction bottle and shaken for 30 seconds. Using the pipette, 2-3 drops of the extraction mixture is added to each of the tests. The test takes between 3-5 minutes to complete giving a simple yes or no answer.The kit contains the following:2 x Phytophthora test, 2 x sample extraction bottle (containing extraction buffer and ball bearings), 2 x pipette, instructions and disease information card. This is must have for all potato growers this season. Well I have added yet more bargains to my store for you to purchase. Visit my SPECIAL DEALS page and you will find some of the most popular varieties for a knockdown price of £1.99. These are all high grade seed and will grow a great crop for anyone. You had best be quick as once these are sold out that will be it for this special offer. Keep checking this page for more of my amazing potato offers. With Christmas coming up things are getting really busy now. The machines are all working at full capacity and we are now ready to start delivering to all our customers so that they have stock for the new year. We now have some varieties sold out and a few are in limited supply. As a special christmas promotion I am going to slash 33% off the price of Anya 2.5kg packs which will make them the CHEAPEST anywhere on the web so take advantage of it whilst stock lasts. Majestic one of the best all round potatoes now under £3. Pentland Crown and Pentland Squire are some of the largest growing and best tasting potatoes with a variety of uses in the modern kitchen.Boiling/Baking/Roasting and chipping is what these potatoes do best. Give them a try for less than £3 each. Keep checking this blog for all my latest offers and sign up here for a free 10% discount voucher. The cold weather has really set in now. It has never been above -2 today and we can't send potatoes out or receive them in when the weather is like this due to the fear of frost damage. Thankfully all warehouses are fully insulated and can with stand the cold weather. We have now finished our limited offer of selling individual potato tubers and instead we are offering packs of 5 seed potatoes instead. Our biggest sellers at the moment are Beauty of Bute, Flourball, Doon Pearl, Arran Pilot, Desiree and Charlotte. Many customers are now using their free 10% discount and purchasing varieties like Majestic, Maris Piper and Golden Wonder as they are great chippers. More exciting news about our seed potatoes. From today onwards you will be able to use our new promotional vouchers which entitle you to 10% off the retail price of our potatoes. Simply go to the special offers section on our home page and give us your name and email to qualify for this promotion. It really is as simple as that. Here is a quick link to our special offers section.